Before we do any cleaning, we always test each different coloured yarn both wet and 24 hours later when dry. The dry test is to ensure that none of the colour will run or bleed when dry. 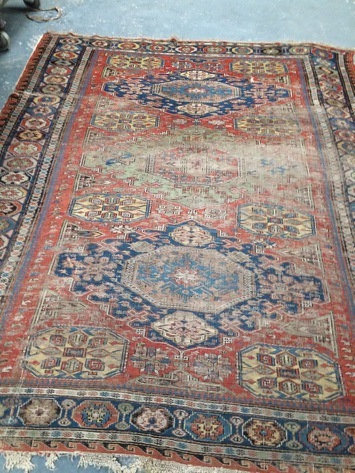 This is a vital reason that we transport your precious rug carefully, and without anything on top or under it, that may transfer colour to or from your rug. This is the main reason for us collecting your rug and cleaning it in our purpose made cleaning centre. Cleaning it on top of your lounge carpet could result in colour transfer onto your room carpet and resulting in a big problem! We also process your rug with a gentle beating machine that breaks down and removes all dry dirt particles that have settled into the base of the fibres. This might mean that your rug will weigh much less when we return it than when we took it away. Sometimes by as much as a kilo! Why not have a completely free and no obligation Rug Assessment, where we visit and look at your rug to assess how successful the cleaning process would be and give you a quote. Find us on Facebook and our own website, and on the NCCA website under Leicester and Loughborough. Or just tweet us on @SJSCarpetClean or contact us.